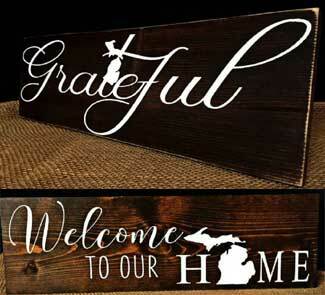 Introducing Michigan Signs by The Blue Spruce Decor Co. These Michigan Signs are handcrafted from pine by The Blue Spruce Co in Lapeer, Michigan. Specializing in rustic decor, each sign is proudly hand sanded, stained and lettered with a crisp, professional appearance. Lettering is in white unless you specify something different. Stain choices include Honey, Special Walnut, Espresso and Kona. These Michigan signs are made to stand alone or can be hung on a wall. The Grateful Michigan Sign measures 18 inches wide x 5.5 inches tall. The T in Grateful is crossed with the Michigan map. Love your home state? This sign is for you! Just say yes to Michigan! The Welcome To Our Michigan Home is perfect for your front porch or entry way and makes a great housewarming gift or any occasion gift. The O in HOME is replaced with the Michigan map. The welcome sign measures 18 inches wide x 5.5 inches tall. Buy Michigan Signs by Blue Spruce Decor!